In the modern working world, human beings and their concerns have become increasingly important. 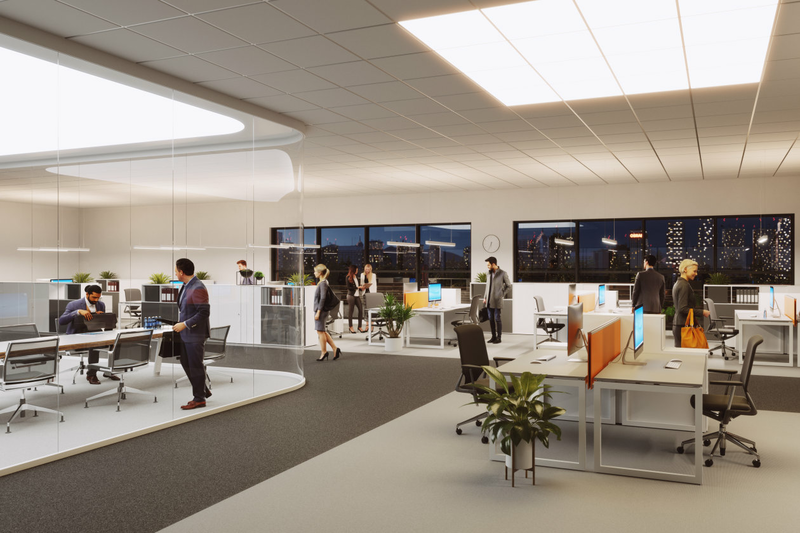 Lighting supports this trend with groundbreaking concepts for Human Centric Lighting (HCL), which focus on humans and the optimal light for their needs. For example, they bring the natural course of daylight and its biological effects into indoor areas. This is achieved by using artificial light with the right brightness and color temperature to supplement the daylight. 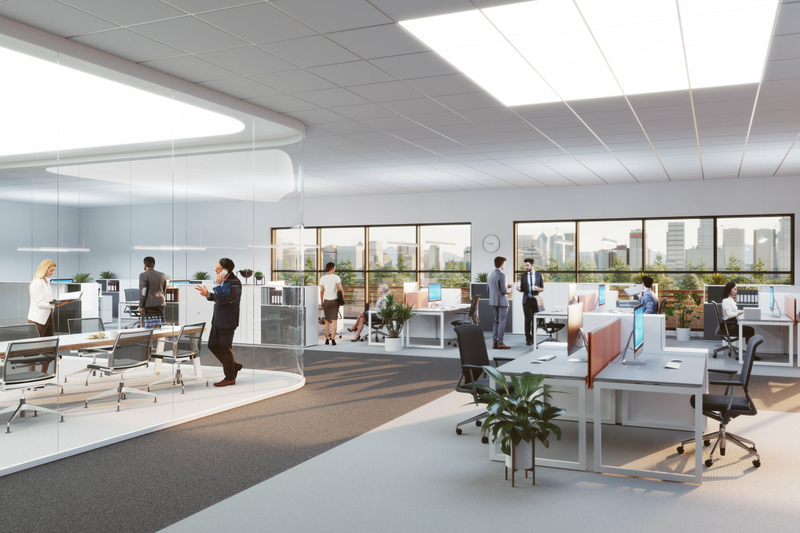 The interplay of light and room climate creates an atmosphere that has a positive impact on the well-being of humans as well as on their productivity and health. OSRAM: In Human Centric Lighting, the biological impact of lighting on humans is the main focus. Can you briefly explain these phenomena? Andreas Wojtysiak: A biological impact is primarily achieved by utilizing the control phenomena of light that coordinate our bodily functions. These include day/night control or activating effects on the central nervous system. Due to evolution, our biological functions and processes are mainly based on our roots in Central Africa – meaning a rhythm with 12 hours of day and 12 hours of night. Our biological system, our internal clock, so to speak, has only partially adapted to life in our corner of the world, where the length of a day changes between summer and winter. OSRAM: This means that our rhythm is based on the difference between day and night. Andreas Wojtysiak: That’s correct. Our body is made to be active during the day and to regenerate during the night when the repair processes take place. For our well-being, both phases are important. The difference between activity and recovery has to be as clear as possible. OSRAM: In case of HCL solutions, how is lighting controlled over the day? Nicolai Heber: During the day, the brightness levels are increased and light with a higher blue content is used. It is this blue content in the spectrum of visible light that addresses the cells in the retina that regulate our internal clock and thus our bodily functions. A wide-area light distribution across the ceiling or the walls is important to create a sky of light. In the evening, spot illumination with a low blue content and low intensity makes more sense. In this case, the light only fulfills the actual visual tasks. OSRAM: How do the color temperatures reflect this? Andreas Wojtysiak: In the morning, color temperatures of at least 5,300 K or 6,000 K help achieve the activating impact of light. During the day, it also makes sense to use high kelvin numbers over long periods of time. Towards evening, the values are reduced to below 3,000 K.
OSRAM: Many studies have proven the positive effects of the new concepts. Is OSRAM also doing research in this area? Andreas Wojtysiak: In the past, we mainly did basic research. In the meantime, we are also part of research projects that analyze real applications to show which benefits can be achieved for the individual. OSRAM: What specifi cally are those benefits? Andreas Wojtysiak: Standard long-term tests in schools, for example, have demonstrated that the rate of errors is reduced and that concentration and sustained attention are significantly improved. These factors are, of course, also important for office work. In addition, health effects can also be noticed, but these are difficult to quantify. Nicolai Heber: The individual feels more at ease, can concentrate better and is more alert. Of course, companies also profit from this because their office staff is more productive, makes fewer mistakes and is less often sick. OSRAM: Employees working with more focus are naturally also in the best interest of the companies. Andreas Wojtysiak: There are market studies that show an increase in the performance of employees, which can be translated into amortization times. Peter Bach: The daylight simulation generally improves the living conditions of humans. This can be in the office, in production plants or in the health sector, for example, in retirement homes or hospitals. It also supports professional athletes by improving their concentration and power. OSRAM: Does this mean that HCL concepts have a positive benefit-cost ratio? Andreas Wojtysiak: In terms of applied energy, the cost of HCL solutions is perhaps higher. The most important factors in a company, however, are not the energy costs but the employees. When employees are more productive and more efficient, you can gain much more in the long run. HCL concepts generally make sense for all types of companies. OSRAM: Does HCL pay off for companies of all sizes? Nicolai Heber: The size doesn’t matter. Several studies show that HCL pays off in the end. The initial investment is higher, but absenteeism is reduced and productivity is increased. Most of all, because the concepts can be implemented much easier thanks to modern control technology. OSRAM: What’s the difference between HCL and Tunable White? Peter Bach: While Tunable White is about the personal comfort of the individual, HCL focuses on the biological impact. Tunable White provides the technological opportunity to plan HCL solutions in the best possible way. OSRAM: So where is the trend headed? Nicolai Heber: It depends on the application. Generally, however, the trend is headed towards HCL as these concepts are now easier to implement thanks to LED technology. Tunable White, on the other hand, is ideally suited for applications in the hospitality sector, for example in hotels or restaurants, where changing light moods are crucial. OSRAM: What’s the difference between OSRAM and its competitors? Nicolai Heber: Uncomplicated system use and comprehensibility are the essential characteristics of our HCL concepts and Tunable White solutions. The systems can be commissioned and operated in a convenient way. Moreover, you can adapt them to the application at hand. It’s all about good lighting quality at a reasonable price, with scalable systems for the respective application. We want to make HCL easy. OSRAM: How do you see the future? Nicolai Heber: The idea behind HCL has been around for a long time. Until now, however, complexity and costs had often been the limiting factors. Right now, people’s thinking is changing. Job satisfaction is becoming more and more important for the employer. The image of the company is also an important aspect when it comes to groundbreaking lighting concepts. Moreover, a market study of ZVEI and LightingEurope shows that high growth rates can be expected from Human Centric Lighting. Therefore, I see great future potential for OSRAM in this area. More information can be found at www.zvei.org and www.lightingeurope.org. When it comes to the well-being, motivation and productivity of employees, the whole working environment plays a crucial role. In addition to an appealing, pleasant room design, the lighting also supports the physical and mental balance. For individually adjusted lighting systems, OSRAM provides cost-efficient HCL components. The entire installation creates various fields of light, which are positioned systematically according to the space utilization concept. 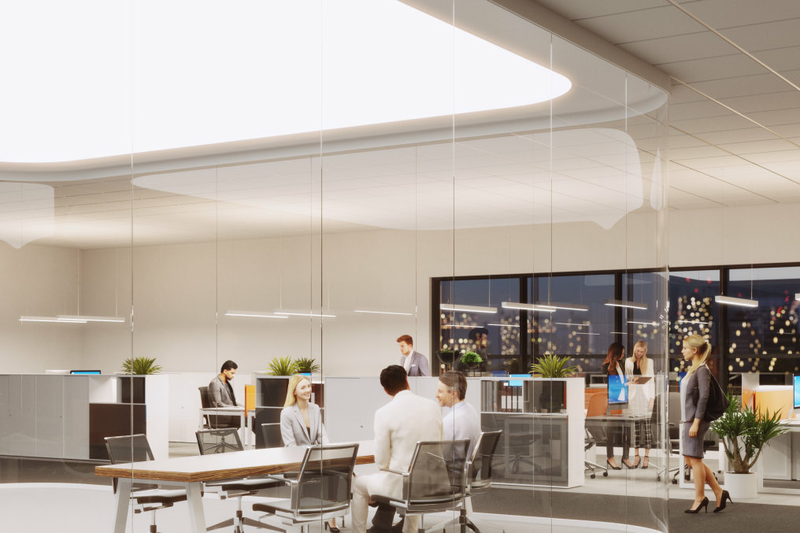 The applied luminaires offer a wide spectrum of white light, with light colors between 2,700 K and 6,500 K, and are therefore ideally suited for the HCL concept. A large sky of light stretches over the meeting area, backlit by BackLED LED modules in a very uniform way and with high light quality. Thanks to the dynamic control of light colors and the activating effects of the light, meetings now take place in a stimulating atmosphere. In order to support the pleasant and activating light atmosphere in the entire room, the recessed ceiling luminaires merge together to form a large-area lighting grid. The integration of the new recessed luminaires into the existing ceiling grid system could be carried out easily with PrevaLED Linear TW or LINEARlight Flex Tunable White LED modules. 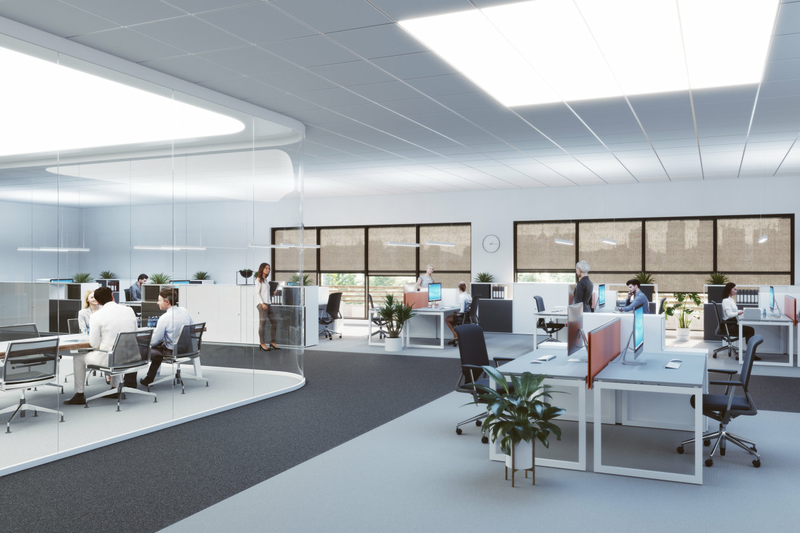 The luminaires can be grouped into individual units and provide a modular system that can be extended by additional elements when the room arrangement is changed. 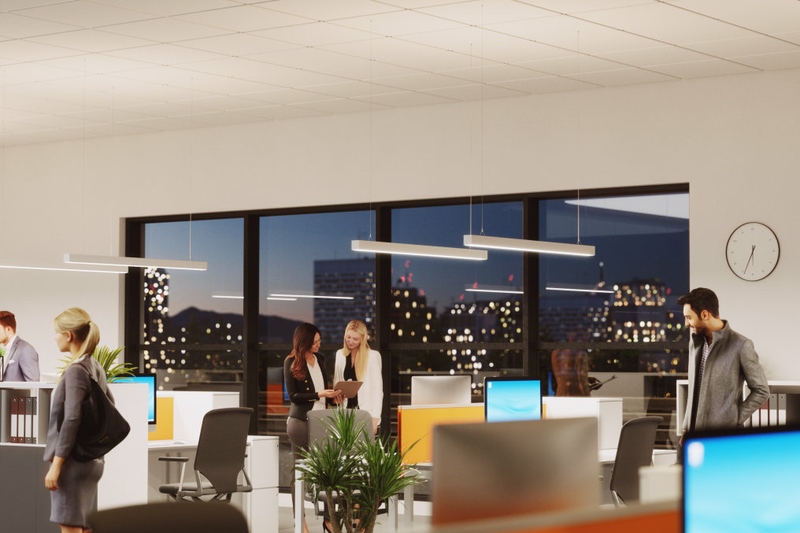 At the workstations, the direct light of pendant luminaires with PrevaLED Linear TW provides high visual comfort, while their indirect light brightens the ceiling and the upper third of the wall without any glare. Thanks to the new HCL concept, the basic lighting creates a wide-area sky of light, giving the entire room a pleasantly bright atmosphere. By means of daylight and presence sensors, the light coming through the window front is also used efficiently. 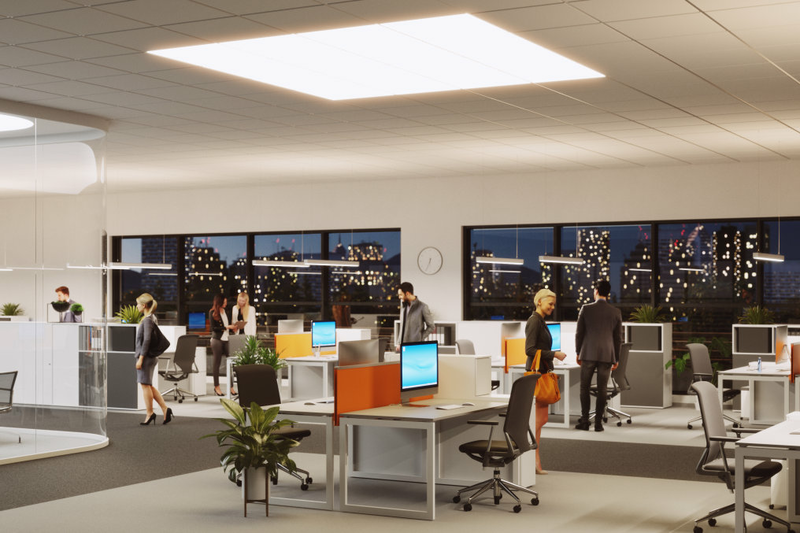 Lighting systems from OSRAM can be scaled easily and flexibly in order to implement installations of any size in office buildings and industrial facilities as well as in the health and education sector. Our range of solutions extends from basic concepts for Tunable White systems to comprehensive HCL installations. The entry level comprises simple Tunable White applications for the manual control of single rooms with the DALI MCU TW. The DALIeco BT for luminaire and ceiling integration as well as the DALI ACU BT, which has been optimized for flush-device boxes, also allow the daylight- and presence-dependent control of single luminaires and luminaire groups as well as convenient control via app. 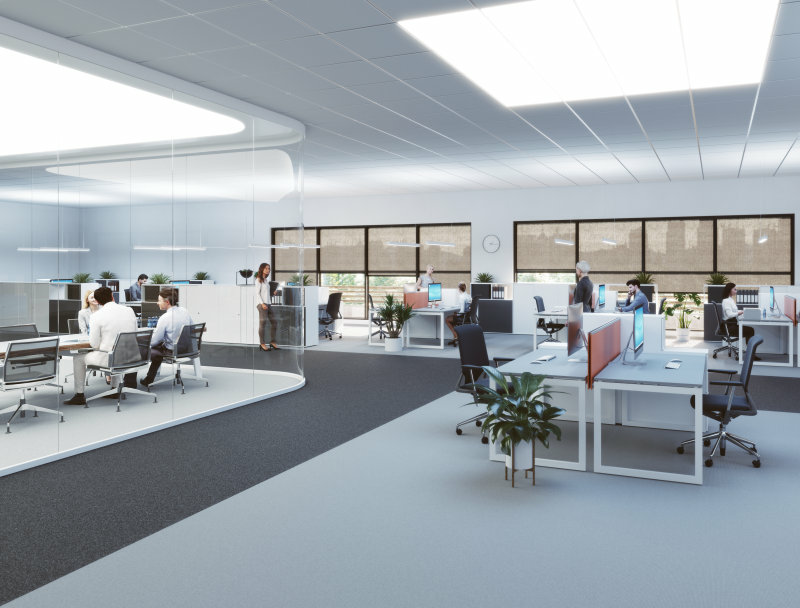 DALI PROFESSIONAL helps you to realize dynamic, daylight-dependent lighting control, also via app, for example in open-plan offices or production halls. The configuration software offers an easy adjustment of the functions. Multiple users can access the control in parallel.